Between 1890 and 1896, the Austrian Empire replaced the Arms definitive stamp types with a brand new series of definitive postage stamps, featuring the portrait of Kaiser Franz Josef I. The low denominations feature a left-facing portrait, and the larger, high denominations feature a right-facing portrait. 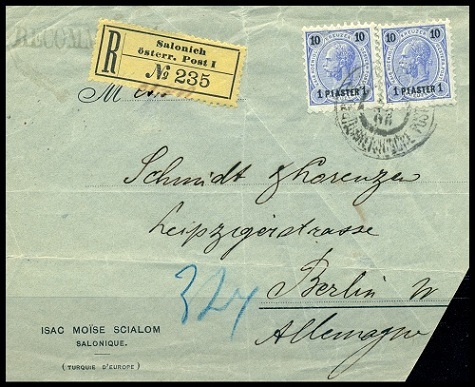 The six major-type, Kreuzer-denominated Austrian stamps of 1890, shown above, were re-valued in Turkish currency, for the Austrian Empire post offices in the Turkish Empire, between 1890 and 1892. The new lower-denomination re-valued definitive stamps feature the original Kreuzer denomination numerals in the upper corners and the new Turkish currency denomination numerals in the lower corners, with the new denomination name in between them. The catalog attributes, for stamps that are perforated 9 to 13 1/2, are as follows. For information on individual stamps with specific perforation gauges, please refer to the specialized catalogs. 08 Pa. on 02 K. (1892 - Mi. #20, Sc. #20) - Brown. 10 Pa. on 03 K. (1890 - Mi. #21, Sc. #21) - Green. 20 Pa. on 05 K. (1890 - Mi. #22, Sc. #22) - Rose. 01 Pi. on 10 K. (1890 - Mi. #23, Sc. #23) - Ultramarine. 02 Pi. on 20 K. (1890 - Mi. #24, Sc. #24) - Olive Green. 05 Pi. on 50 K. (1890 - Mi. #25, Sc. #25) - Violet. 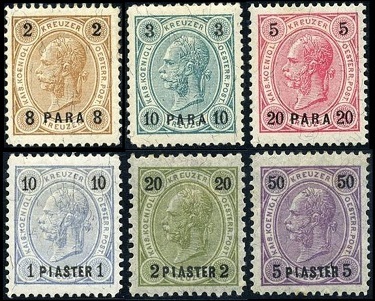 The six major-type, Kreuzer-denominated or Gulden-denominated Austrian Empire stamps of 1890-1896, shown above, were re-valued in Turkish currency, for the Austrian Empire post offices in the Turkish Empire, between 1891 and 1896. 02 Pi. on 20 K. (1891 - Mi. #28, Sc. #26) - Olive Green. 05 Pi. on 50 K. (1891 - Mi. #29, Sc. #27) - Violet. 10 Pi. on 01 G. (1892 - Mi. #26, Sc. #28) - Blue. 20 Pi. on 02 G. (1892 - Mi. #27, Sc. #29) - Carmine. 10 Pi. on 01 G. (1896 - Mi. #30, Sc. #30) - Pale Lilac. 20 Pi. on 02 G. (1896 - Mi. #31, Sc. #31) - Gray Green. At the end of 1899, the Austrian Empire officially changed their currency from Kreuzer / Gulden to Heller / Kronen. This required that they modify their contemporary definitive postage stamps to have the new denomination names on them. 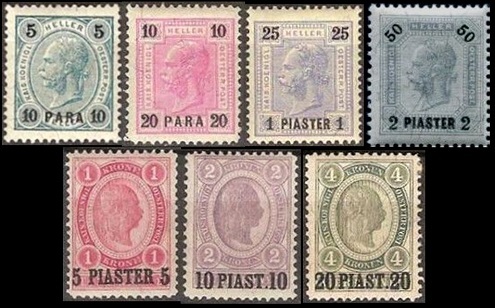 The seven major-type, Heller-denominated or Kronen-denominated Austrian Empire stamps of 1899-1901, shown above, were re-valued in Turkish currency, for the Austrian Empire post offices in the Turkish Empire, between 1900 and 1901. The catalog attributes, for stamps without varnish bars and that are perforated 12 1/2 to 13 1/2 and compound, are as follows. 10 Pa. on 05 H. (1900 - Mi. #32, Sc. #32) - Blue Green. 20 Pa. on 10 H. (1900 - Mi. #33, Sc. #33) - Rose. 01 Pi. on 25 H. (1900 - Mi. #34, Sc. #34) - Ultramarine. 02 Pi. on 50 H. (1900 - Mi. #35, Sc. #35) - Gray Blue. 05 Pi. on 01 K. (1900 - Mi. #36, Sc. #36) - Carmine Rose. 10 Pi. on 02 K. (1900 - Mi. #37, Sc. #37) - Gray Lilac. 20 Pi. on 04 K. (1900 - Mi. #38, Sc. #38) - Gray Green. The catalog attributes, for stamps with varnish bars and that are perforated 12 1/2 to 13 1/2 and compound, are as follows. 10 Pa. on 05 H. (1901 - Mi. #39, Sc. #32a) - Blue Green. 20 Pa. on 10 H. (1901 - Mi. #40, Sc. #33a) - Rose. 01 Pi. on 25 H. (1901 - Mi. #41, Sc. #34a) - Ultramarine. 02 Pi. on 50 H. (1901 - Mi. #42, Sc. #35b) - Gray Blue. For information on individual stamps with specific perforation gauges, please refer to the specialized catalogs. Between 1903 and 1907, the surcharge format of the offices in the Turkish Empire low denomination stamps was changed. Unlike previous issues, the new surcharges had the Turkish currency numerals and denomination names both at the top and the bottom of the stamps. 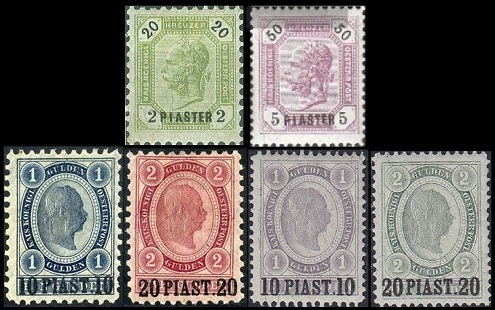 The six major-type Austrian Empire stamps of 1903-1907, shown above, were overprinted in Turkish currency, for the Austrian Empire post offices in the Turkish Empire, between 1903 and 1907. These stamps were issued in only two perforation gauges, 13 x 12 1/2 and 13 x 13 1/2. They are worth the same. The catalog attributes, for stamps with varnish bars, are as follows. 10 Pa. (1903 - Mi. #43, Sc. #39a) - Blue Green. 20 Pa. (1903 - Mi. #44, Sc. #40a) - Rose. 01 Pi. (1903 - Mi. #45, Sc. #41a) - Ultramarine. 02 Pi. (1903 - Mi. #46, Sc. #42a) - Gray Blue. The catalog attributes, for stamps without varnish bars, are as follows. 10 Pa. (1905 - Mi. #47, Sc. #39) - Blue Green. 10 Pa. (1907 - Mi. #51, Sc. #43) - Yellow Green. 20 Pa. (1905 - Mi. #48, Sc. #40) - Rose. 30 Pa. (1907 - Mi. #52, Sc. #45) - Violet. 01 Pi. (1905 - Mi. #49, Sc. #41) - Ultramarine. 02 Pi. (1905 - Mi. #50, Sc. #42) - Gray Blue. 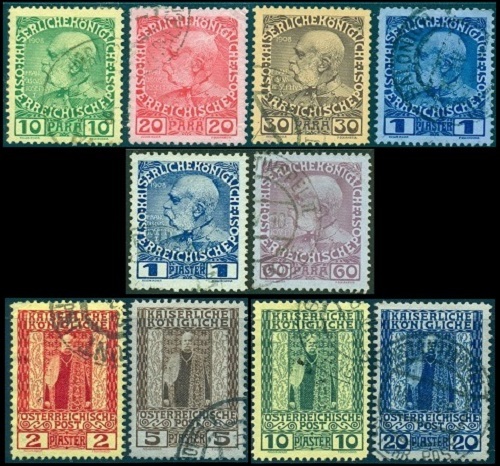 The ten pictorial definitive stamps shown above (Mi. #53-61, Sc. #46-54) were issued during July 1908 to celebrate the 60th Anniversary of the Reign of Emperor Franz Josef I. Both shades of the 1 Piaster denomination stamp are shown above. These new definitive stamps were printed on surface-colored paper. 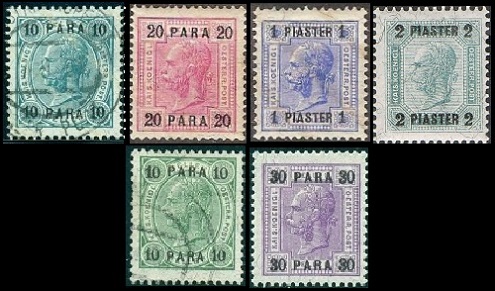 During 1914, the 20 Para and 1 Piaster denomination stamps, were re-issued on paper that was colored all the way through. They are shown directly above (Mi. #62-63, Sc. #57-58).